My dad shook off the extra dirt and trimmed the excess greens from the top. They didn’t look quite like grocery store leeks, but these came from our own backyard. Sine they are a hardy plant, they can just stay in the ground all winter. Seems pretty convenient, too bad all vegetables can’t just last all year! 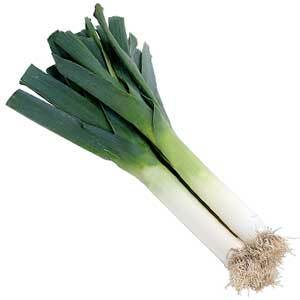 Leeks are part of the family with onions and garlic, but they don’t end up with a large bulb. Rather, they look like a pretty big green onion. You only use part of the whole plant though — you trim off most of the top of the greens and then the roots too, so you just have the stalk left. When chopping to use later, my dad told me that it’s very important to rinse the leeks well, such as in a colander, because dirt tends to work its way into the pieces. But anyways, I had grand plans in my head for what to do with these leeks: risotto with asparagus and leeks. I’ve never made risotto, but after having one of the most delicious bowls of it at Local Roots, I figured I’d try it out; first I’d have to find fresh asparagus at the farmers’ market. Unfortunately, when snow started falling Sunday morning before I drove back to Harrisonburg and I rushed to finish breakfast and gather up my stuff, the leeks were forgotten. The two stalks sat in their bag on the shelf in the fridge, waiting for me to pick them up. There’s always next time.